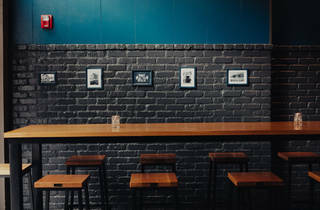 This Downtown watering hole turns the traditional sports bar on its head with fantastic cocktails and gourmet bites. 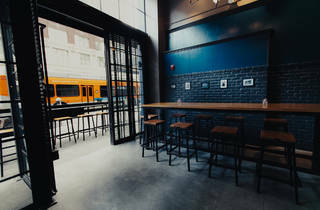 What makes a bar "chill"? At its core, chill means low-key, devoid of intensity, overstimulation or chaos. But for something to be wholly chill, it must also be supremely enjoyable, not in spite of being low-key, but because of it. 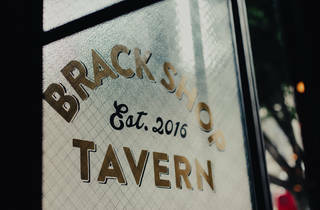 Now that we’ve agreed to terms, allow me to introduce the chillest bar in Downtown L.A. right now: Brack Shop Tavern. The atmosphere is seductive. 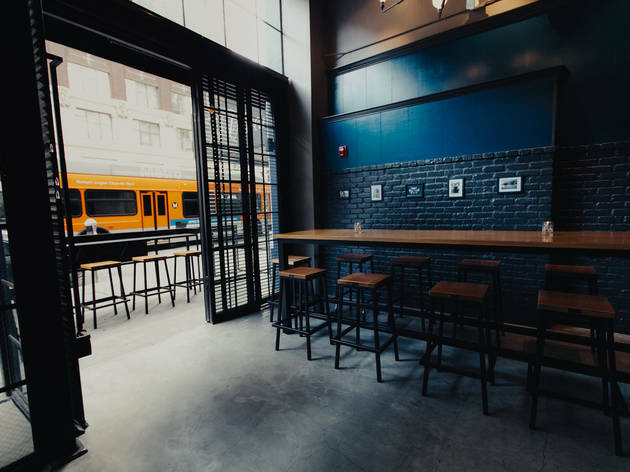 The black brick and deep blue paint that wrap around the long, narrow space lit by soft bulbs and candles on every table soothes and invites. Young professionals congregate on dates and in small groups. 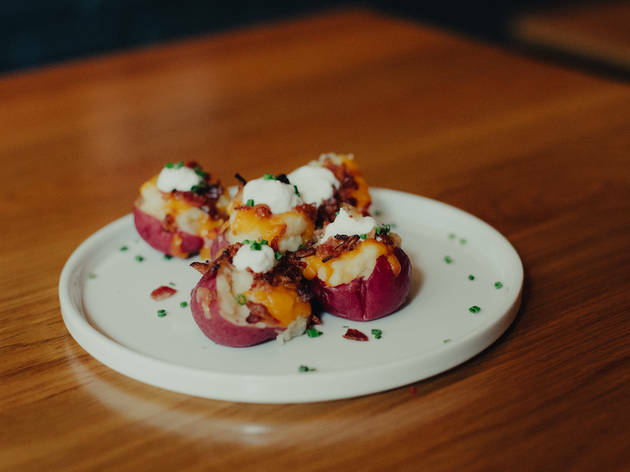 They’re over the club scene and now demand high-quality drinks and eats served without a hint of pretension—and that’s exactly what Brack Shop delivers. 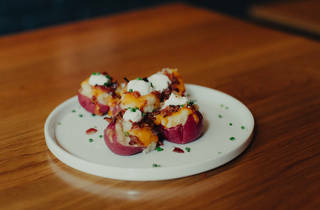 Previously the neighborhood beer haunt, Barrel Down, Brack launched itself into the big leagues by adding an elite cocktail program and gourmet plates to a strong beer selection that appeals to every palate. On a Friday night you’d peg it for hipster-chic by the bearded, tattooed barbacks in denim aprons mixing premium drinks, but you’d be wrong. 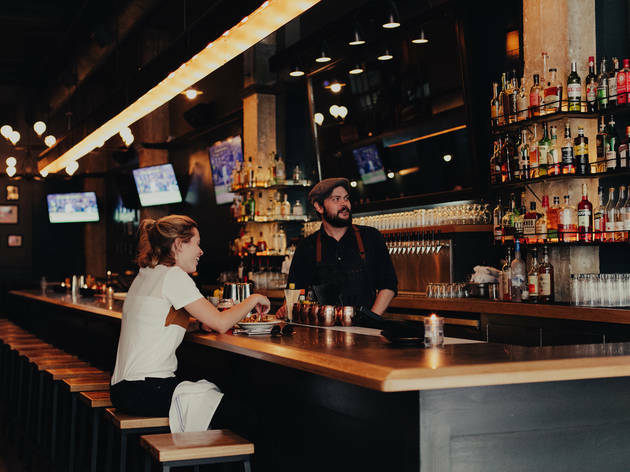 Each server will befriend you and insist you come back for Sunday brunch, when the neighborhood gathers to watch NFL Ticket on a massive screen above the bar. Six other flat screens dot the back walls, to be viewed while patrons feast on a mimosa-laden brunch that regulars can’t stop raving about. Understated and never too crowded, there’s something about this place that captures the heart like few bars can. 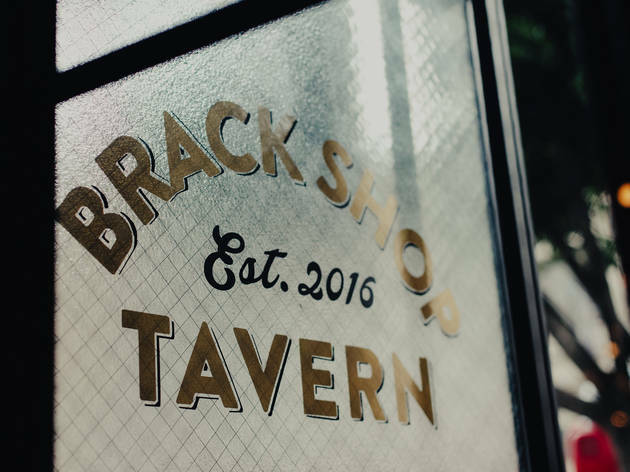 Good for: As a bar, Brack Shop is expertly versatile and eludes categorization. 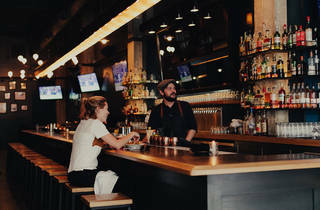 A sports bar for foodies, you can come for a delicious meal just as easily as for a housemade highball or a double IPA. 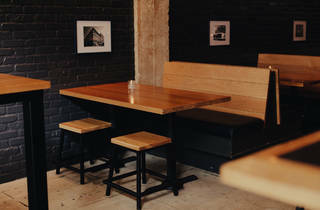 The ambiance is intimate no matter where you sit, and the volume is perfect for private chit-chat. 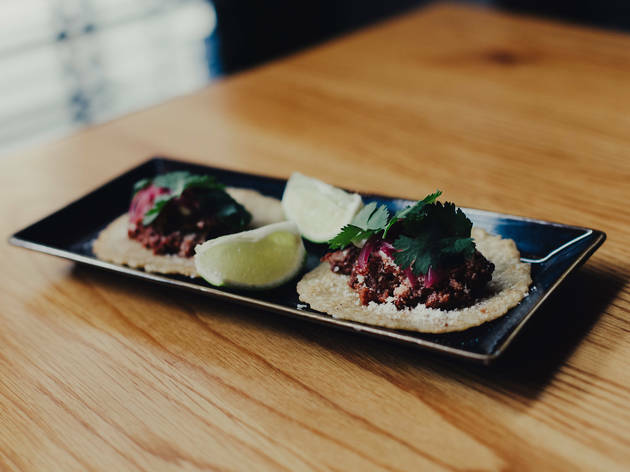 Bring a date, catch up with an old friend or corral your favorite people from work, the ones who appreciate the finer things. The scene: Football viewings are lively, and the snug seating options place interesting strangers never too far away. 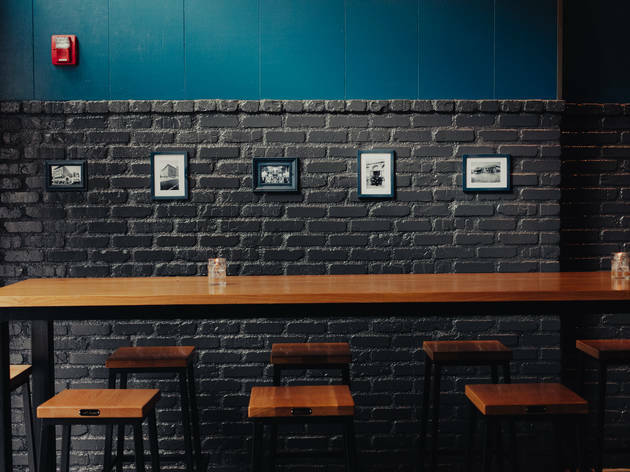 When games are over, TVs turn off so groups and couples can focus on each other in a secluded backroom booth, on the outdoor patio or at the inviting bar. 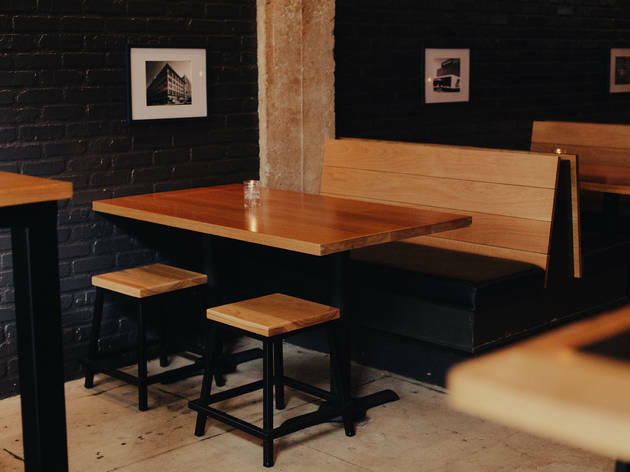 Once seated you’ll overhear a regular explaining why they love this place. You’ll also watch first-timers, in search of a bar that “wasn’t too crowded,” elated by what they’ve found. Drink this: A drink you’ll hear mentioned more than any other is the Rum Bum ($12). Once you cave to peer pressure, it will appear served up, in a coupe glass and with a frothy head. The drink is ice-cold and packs a delectable, tropical fruit melange you’d expect on the roof of the Caribbean's ritziest hotel. The viscous mouthfeel will linger, reminding you of just how great your drink is. Like spicy? 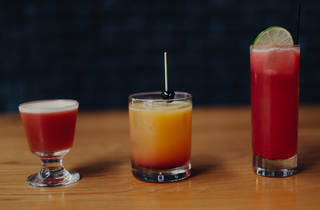 Don't leave without trying Just Another Tequila Sunrise ($11). It’s a layered drink, meaning three drinks in one. 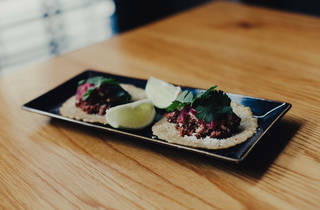 The first four sips are aggressively spicy with passionfruit, something you power through before the spice almost disappears into the sugary second layer and the hibiscus-infused third. This drink demands attention. Finally, the Strawberry Letter 23 ($10) is deceptive. 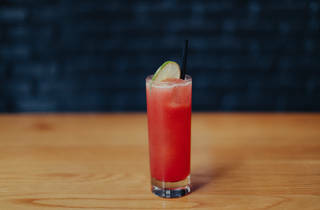 Its name and dark pink color suggest a sugar-heavy drink, but campari, vermouth and peppercorn amount to a rugged libation with a flashy personality. 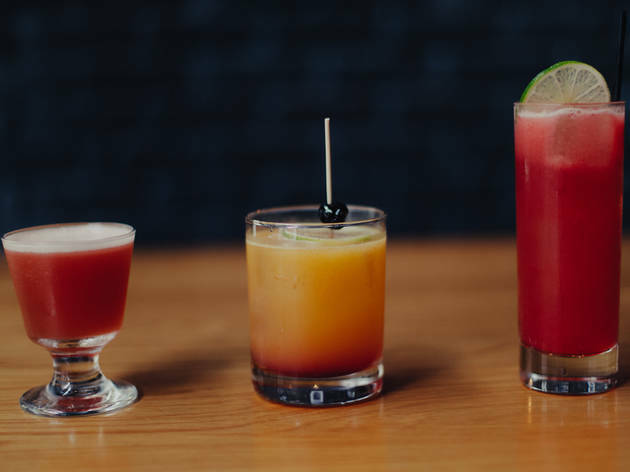 Our tip: Introduce yourself to a bartender. Your visit will be injected first with small talk, then drink tips, then deep conversation, then free shots. Come on in and chill. One of my staple places in DTLA since it's super convenient to everything. 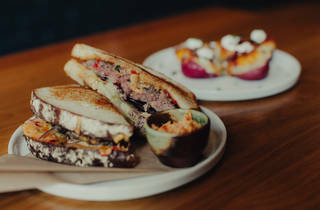 Brack Shop Tavern has a great selection of food and drinks - even the cocktails! They also have a great pita bread and hummus spread that I absolutely loved! There's a great happy hour and awesome seating! Not a sports bar fan, but the food and drink offerings here are worth putting up with all the TV sets. 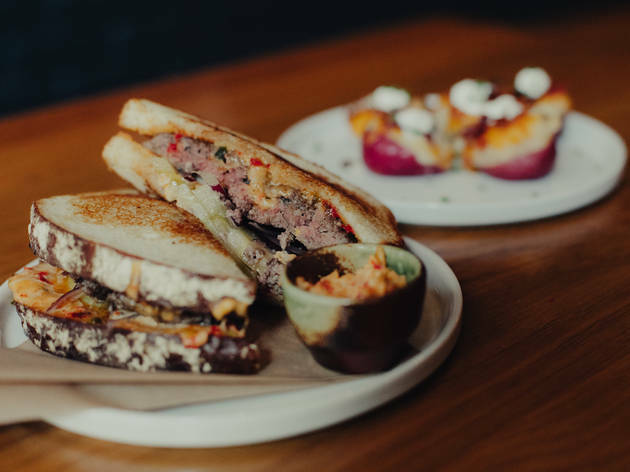 The patty melt is out of this world! A good after-work spot.